Carlos Vogt is president of São Paulo Virtual University (UNIVESP), which he helped to launch in 2010. Both a linguist and a poet, he is full professor in the field of argumentative semantics at University of Campinas (UNICAMP), of which he was president (1990-1994) and associate dean and general coordinator (1986-1990). Since 1995, he has been coordinator of UNICAMP’s Laboratory of Advanced Studies in Journalism (LABJOR). He graduated in Literature from University of São Paulo (USP), has a master’s degree in Modern Literature from Université de Franche-Comté (France) and a doctorate in Social Sciences from UNICAMP’s Institute of Philosophy and Human Sciences. 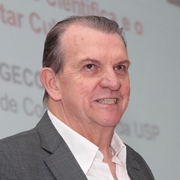 He was secretary of higher education of the state of São Paulo (2009-2010), president of the São Paulo Research Foundation (FAPESP) (2002-2007) and vice-president of the Brazilian Society for the Progress of Science (SBPC) (2001-2005). In 2005, he received the President’s Commendation of the National Order of Scientific Merit, as well as the title of doctor honoris causa from École Normale Supérieure de Lyon (France). He is the numerous books, including O intervalo semântico: contribuição para uma teoria semântica argumentativa (2009), Poesia reunida (2008), Ilhas Brasil (poems, 2002), A imprensa em questão (co-author, 1997), Mascarada (poems, 1997), Cafundó: A África no Brasil (co-author, 1996), A solidez do sonho (1993), Metalurgia (poems, 1991), Linguagem, pragmática e ideologia (1989) and Crítica ligeira (1989).